In the great wide open, artisanal sapphire mining can feel a lot like a day of fishing. Pictured from left to right: Green Lake Graduate Gemologist, Dan Canivet; Miner and Master Lapidary Drew Barns; and Green Lake Gem Buyer Brant Kane. To spend a day sifting through rocks with Montana miner Drew Barns, you might come to believe sapphires are anything but rare. On his sprawling property along a bend in the Yellowstone River stands a hard-worn sluice, the go-to machine for a placer miner like Drew, who loads the hopper with earth from ancient river beds. An engine fires up and the sluice rattles melodically, slowly separating the mineral-rich gravel from sand and larger rocks, concentrating it into batches likely to host sapphires. The resulting bed of stones roll down a conveyor belt and are carefully picked over with sharp eyes, in search for what could be otherwise mistaken for ordinary glass. Grinding to a halt and echoing off towering mountains that flank the valley, the sluice reveals a small handful of colorful gems. Drew calls it an especially fortuitous day, pointing to the many days where he’d have better luck trout fishing. 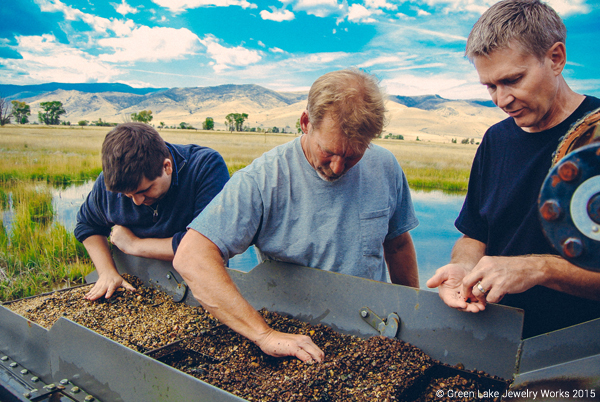 After a day’s prospecting Green Lake Diamond Buyer Brant Kane holds a handful of sapphires and garnets. This is more or less the day-to-day operation, and for those who think sourcing rare earth materials equates to environmental destruction or social exploitation, you’d find this place to be anything but. The site, design and performance of this mine adhere strictly to comprehensive State guidelines. All of the water used is recycled from an adjacent settling pond to keep sediment from entering active waterways. The material brought to the site comes only from alluvial deposits nearby (these are the shoals, deltas and tributaries from rivers that flowed eons ago). It seems the operation attracts more blue birds and white-tailed deer than it does hardhats or trucks. 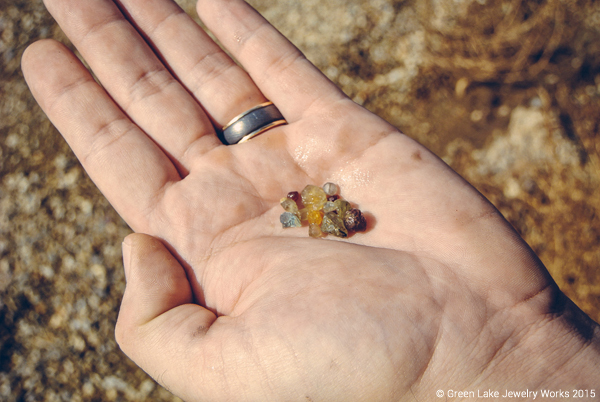 During the spring and summer months vacationing families and amateur rock hounds also pay the mine a visit, each trying their hand to find sapphires – and we’re proud to report it’s also where we find ours. 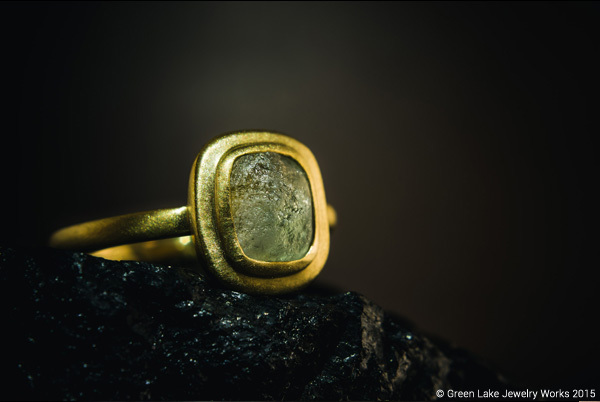 Prior to heading the Green Lake Gem Lab, Gem Buyer and self-proclaimed ‘rockaholic’ Brant Kane dreamed of sourcing sapphires direct from Montana. For years he lobbied designer lines and retailers focused on bridal to incorporate these unique gems into their rings. He discovered however that most companies still preferred to source sapphires from abroad. While in the U.S., Montana may boast the richest deposits of corundum (the mineral that makes up sapphires and rubies), an overwhelming majority of the gems that sell have traditionally come from South Asia (places like Sri Lanka and Myanmar). Because much of the mining taking place in Montana today is relatively small-scale, getting a regular supply of consistent, production-grade sapphires can prove to be a more trying (and pricier) endeavor than simply working with a larger consortium from afar. 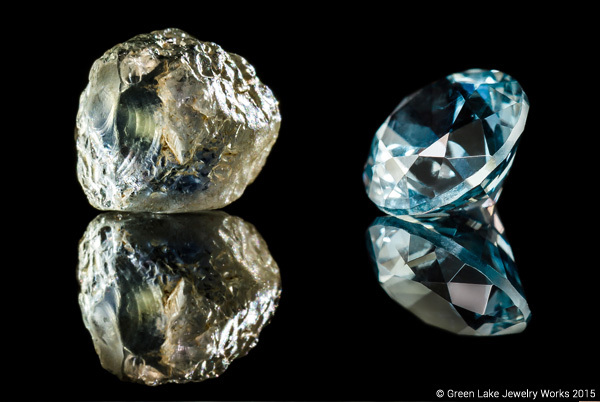 So if you were unaware that some of the rarest, most beautiful sapphires in the world are discovered right in your backyard, you’re not alone. For many large jewelry lines, there’s never been enough commercial appeal to promote them. Enter Green Lake Jewelry Works. If you know anything about Green Lake, hopefully it’s that we don’t just sell rings; we make them. Each and every piece we design with our clients is handcrafted right here in an open workshop, where artists strive to create one-of-a-kind rings like no other. We don’t really care if we can get 200 of the same looking sapphire, because we’re never interested in making the same looking ring. In Green Lake Brant finally found a receptive audience just as interested in sourcing from Montana as he was. Now we’re pleased to present a collection of sapphires like no other. 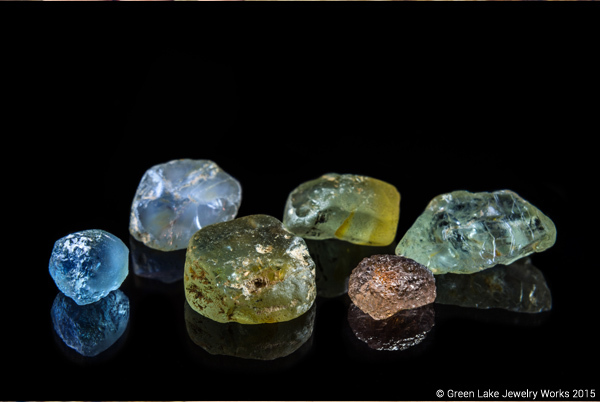 The Green Lake Gem Lab selects sapphires both finished and rough to provide custom jewelry clients with the opportunity to guide the perfect cut and color they’re after. 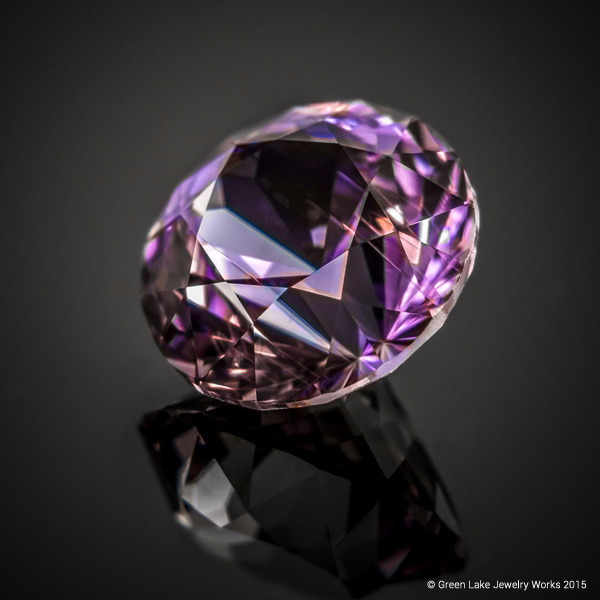 WHAT MAKES a MONTANA SAPPHIRE SO DIFFERENT? 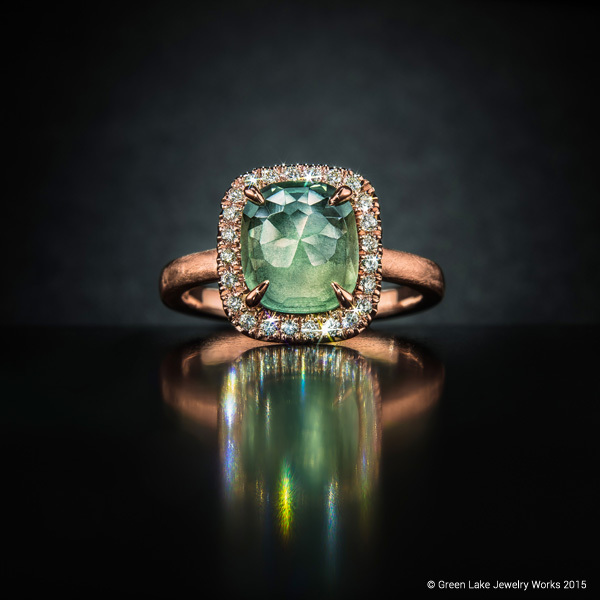 The kind of sapphires Green Lake is sourcing from Montana are different in the way they’re mined. Unlike some sapphire deposits that lay deep underground in hard rock dikes (requiring more extensive tunneling and excavation), these sapphires are sourced from alluvial deposits. An alluvial sapphire deposit is where the mineral corundum was ejected from prehistoric volcanoes with trace elements of titanium and aluminum, left to roll over millennia down rivers that have long since dried up. This means their mining is more ecologically sustainable, free of the extensive tunneling or outright removal of mountaintops that can devastate the natural environment (a lesson Montana learned all too well from the Berkley Pitt Superfund Site). Sapphires from an alluvial deposit can be easy to spot because they appear tumbled and polished from ages of elements passing over it. So close to the surface and seemingly easy to collect, it’s not uncommon for someone with pea-gravel from the area to stumble upon a rough sapphire in their driveway. Oblivious to what they found, even the first gold miners to Montana would discard these little blue pebbles in search of gold, which is significantly (and ironically) less valuable than sapphire. But don’t assume that because they’re easy to extract, they’re easy to find. There are lodes of sapphires yet to be discovered in Montana, a region that hides some of the rarest colors in the world. When we think of sapphires, our minds wander to crown jewels, a rich hue of corn-flower blue and maybe even an iconic bottle of Bombay Sapphire Gin. Montana is indeed endowed with this kind of blue (especially those from the Yogo gulch), but also offers a wild array of color scarcely found anywhere else in the world. From forest green to golden yellow and fiery orange gems, an era of volcanic and glacial movements has bound unique blends of minerals with corundum to provide sapphires like no other. There are bi-colored sapphires of yellow and blue, color-change sapphires that go blue to green to purple in different light, and one-of-a-kind hues that possess long, silky inclusions that spread like microscopic feathers. With hundreds of prime rough and cut specimens now in the lab, it’s blatantly obvious no two Montana sapphires are alike. An oval-cut untreated Montana sapphire with an emblematic corn-flower blue coloring and flash of golden yellow in its center, viewed only from certain angles. One of the rarest colors of sapphire is lavender. This round brilliant from Montana gleams with velvety iridescence. 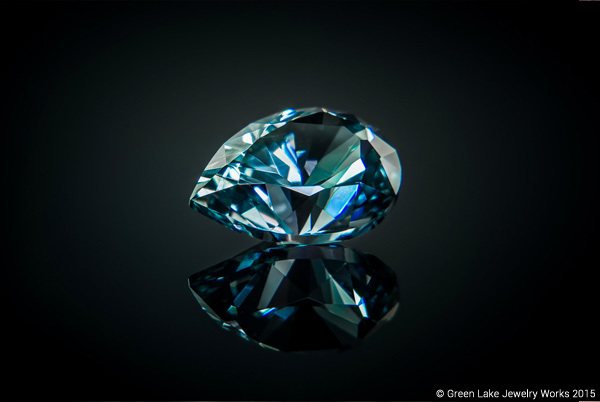 Though Montana provides for unique colors and combinations in its sapphires, the emblematic hues of blue are also abundant. 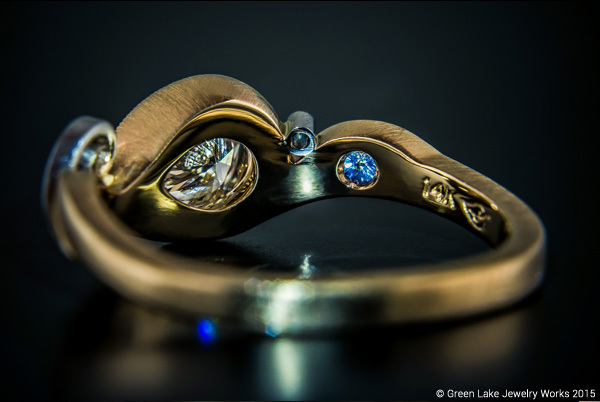 Last year a couple came into the Seattle studio and asked if we could custom-cut a sapphire into the pattern of a water lily, and as a custom jeweler priding itself in the ability to create any type of ring, we simply couldn’t back down. Now as a newcomer to fine jewelry, it might seem like a pretty straight forward request, “you’re a jeweler who sets jewels, so can you cut some jewels just for me?” But being a lapidary (the person who cuts gems on a fast-moving grooved wheel) is totally different than being a jeweler. It’s almost like asking an architect to mill limber. While an architect understands the kind of wood needed to build a house, they’re unlikely to be trained in breaking down logs on a head saw by themselves. Lucky for us, Green Lake actually does have a trained lapidary, a guy who was just waiting for the opportunity to roll up his sleeves and shape raw materials from the start. Rough sapphires are faceted and polished by adhering them to a ‘quill’ and running them over a fast moving metal wheel that’s been treated with mineral oil and diamond grit. 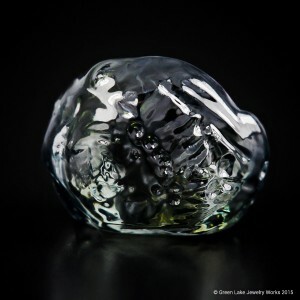 Graduate gemologist, designer and up and coming lapidary Dan Cavinet came to Green Lake via the Gemological Institute of America (GIA) to help clients create rings that simply can’t be purchased; they have to be made. He’d seen a few opportunities to cut center stones and accent baguettes for a handful of Seattle clients, working late into the night at his home faceting machine to make truly custom pieces. When Brant mentioned the potential of sourcing rough sapphire directly from mines in Montana, Dan jumped at the chance to join in on a site visit and bring back to the workshop a range of exceptional stones to be customized for rings and bands. Whether these sapphires are cut per a client’s request or added to the Green Lake collection, each gem is cut for beauty over yield. What this means is if a 20 carat piece of rough sapphire is brought into the lab, we’ll not necessarily seek to parse out the stone and cut it for maximum carat weight or see if it can be divided into multiple stones for a better profit margin. Instead we’ll go for the most beautiful cut, clarity and color, regardless of yield – not only because it looks better, but also because there’s more joy and pride in being able to produce something special. Cutting gems for their inherent beauty and natural coloring over yield alone provides for a more distinguished and noteworthy sapphire. 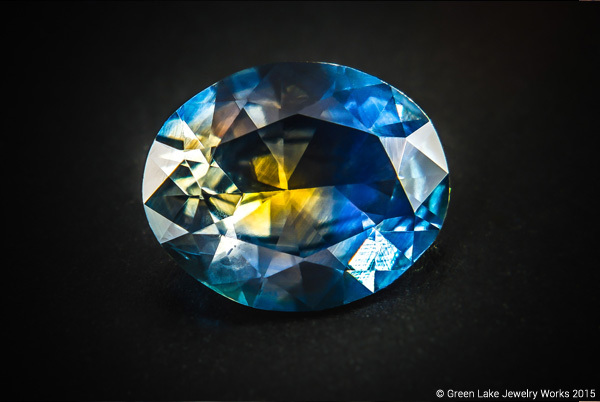 In earlier years at Green Lake, anyone specifically interested in Montana sapphires were your typical gem and mineral enthusiast, who would oftentimes provide stones they found on their own to be set. Nowadays however it’s not uncommon for first-time fine jewelry buyers to ask for these sapphires by name. Perhaps with so much information at one’s fingertips it’s easy to get lost in all the unique and even obscure options available when it comes to tying the knot. For many, gone are the days of strictly traditional diamond solitaires. A ring is symbolic of the sacred bond between couples and uniquely representative of the people who wear them. Our clients increasingly seek out ways to showcase their story in a ring, incorporate styles that speak directly to them and hide little details only they’ll ever know. With a wide range of color, unique origin and a transparent sourcing process, Montana sapphires are becoming a popular gem to achieve these things. Hidden Details: Setting gems on the inside for the wearer’s eyes only is one way to make a ring deeply personal. Featured here is a Montana sapphire set on the inside of a 14K gold ring. There’s an implicitly rustic appeal to Montana sapphires. Maybe it’s because we can envision where they come from. The steely blue mountains, swaying cottonwood trees and boundless sky inspire settings and ring designs more reflective of the natural world. So much so, some clients actually elect to keep their center stones rough and untouched, save for a flattened bottom to set. Others may have their sapphire cut, but with less facets than a contemporary gem, relying instead on rose or old—mine facet arrangements to capture a timeless elegance without being too fussy. But don’t rule Montana sapphires out from more traditional settings, as some of these gems were just meant to be set in an over-the-top princessy ring! 18kt yellow brushed gold ring featuring a rough un-cut Montana sapphire center. 2.97ct rose cut Montana sapphire with (25) .19ctw Canadian diamonds. Available for sale HERE. 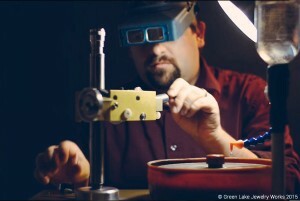 Montana Sapphires: From Mine to Market from Green Lake Jewelry Works on Vimeo. Want to mine for your own sapphires? Visit Drew Barns at Gem Valley. All photos by Green Lake photographer Daniel Zetterstrom and Eric Robertson.